Cambridge (UK), 23rd November 2018 – FlexEnable, the leader in the development and industrialisation of organic electronics for flexible displays and sensors - has won the prestigious Disruptive Innovation of the Year Award for 2018 at last night’s TechWorks Awards. FlexEnable has been recognised for its glass-free, conformable organic liquid crystal display (OLCD). The technology, which uses organic thin-film transistors (OTFTs) on a plastic sheet, brings the same vivid colour and smooth video content as glass-based LCDs. Compatible with existing LCD production lines and scalable to large area, this technology is currently being transferred to mass production in China, to meet the immediate market needs for flexible displays in applications including consumer electronics, automotive and digital signage, representing an $80Bn addressable market. The awards celebrate the year’s key electronics innovations, people and companies from across the UK and Ireland. The TechWorks Awards have run annually since 2001 - originally branded as the NMI Awards. The Disruptive Innovation Award is given to the company that can demonstrate a significant business impact through innovation. This can cover any aspects of innovation whether in business process, manufacturing, service provision or product development. 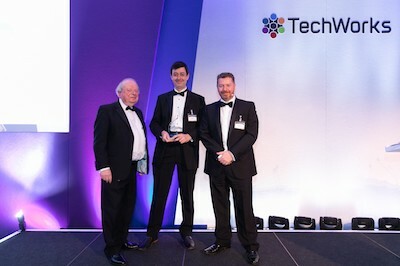 The award was presented by the renowned Journalist John Sergeant, who highlighted the “many great entries covering a wide spectrum of technologies” that were received this year. FlexEnable’s OLCD technology is four times thinner (less than 0.3 mm) and more than ten times lighter than conventional glass-based displays, allowing the OLCD to be conformed to almost any surface. Last night’s awards were held at a prestigious venue near London’s Tower Bridge. TechWorks is the UK Industry Association for ‘Deep Tech’; the underpinning technologies such as AI, robotics, 5G, machine vision, IoT, analytics and automation that drive the new economy. TechWorks is an industry association at the core of the UK deep tech community with an ambition to harness our fantastic engineering and innovation to develop the UK’s position as a global technology superpower.